In two reports issued by the New York and St. Louis branches of the Federal Reserve, researchers found that high numbers of student loan borrowers are behind in making payments. According to the New York Fed, 11.10 percent of student loan borrowers were 90 or more days past due on their payments during the first quarter of 2015. This is a slight improvement over the fourth quarter of 2014, when 11.30 percent of student loan borrowers were 90 or more days behind with their payments. The Fed notes that these percentages do not include borrowers who are behind on payments but who are not required to make payments due to forbearance or other approved payment deferrals. The burden of student loan debt is a serious consideration for the housing sector, as student loan debt can keep would-be buyers from qualifying for mortgages needed to buy homes. Worse, delinquency on student loans can damage borrowers’ credit and create further obstacles to getting a mortgage. The Labor Department reported that job openings fell to 4.99 million in March as compared to February’s reading of 5.14 million job openings. March job openings increased by 19 percent year-over-year. There were about 1.72 job seekers for each job opening in March, which is lower than the reading of 1.77 job seekers per job when the recession started in December 2007. Retail sales were unchanged in April against an expected increase of 0.10 percent and the March reading of 1.10 percent. Retail sales without the automotive sector expanded by 0.10 percent against expectations of 0.40 percent growth and March growth of 0.70 percent. Increasing fuel prices and skepticism over economic conditions likely contributed to slack retail sales. Weekly jobless claims provided some good news as they came in at 264,000 new claims against expectations of 275,000 new claims and the prior week’s reading of 265,000 new jobless claims. This was the third consecutive week that new jobless claims were less than 270,000; this has not occurred since 1975. Freddie Mac reported that average rates for fixed rate mortgages rose, while the average rate for a 5/1 adjustable rate mortgage ticked downward by one basis point. The average rate for a 30-year fixed rate mortgage rose by five basis points to 3.85 percent. The average rate for a 15-year fixed rate mortgage also increased by five basis points to 3.07 percent. Discount points averaged 0.60 percent for fixed rate mortgages and 0.50 percent for 5/1 adjustable rate mortgages. Consumer sentiment as reported by the University of Michigan dropped to a seven month low of 88.6 as compared to April’s reading of 95.9 and an expected reading of 94.9. Consumers are concerned about the economy and their personal finances. The reading for consumer sentiment prior to the recession averaged 86.9 over the year prior to the recession. Economists cited weak wage growth and rising fuel prices as contributing causes of consumer uncertainty. 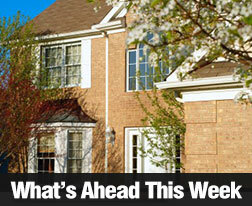 This week’s scheduled economic news includes a number of housing-related reports. The NAHB Home Builders Housing Market Index, The National Association of Realtors® Existing Home Sales report, Housing Starts and Building Permits and the minutes of the Fed’s last FOMC meeting are set for release. Freddie Mac mortgage rates and Weekly Jobless Claims will be released as usual on Thursday.